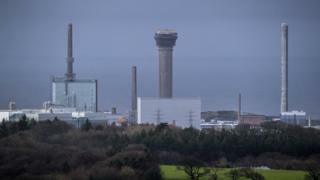 Firefighters at the Sellafield nuclear reprocessing plant in Cumbria have begun a second strike as their dispute over pay continues. More than 60 members of the GMB union began a 12-hour walkout at 06:00 BST following similar action on Tuesday. The union claimed striking firefighters had been warned they could be sacked. Sellafield said it had made a "reasonable offer" which it was "disappointed" to have had rejected. GMB officer Chris Jukes said plant management told union members their jobs could be outsourced and added there was "disregard for the vital work firefighters do". The union argues they have been working beyond their grade in safety and emergency work, such as carrying out paramedic duties, while their pay had fallen behind inflation. In a statement, Sellafield said they had been forced to "buy in a like-for-like service from the private sector" which meant the site was about to "operate more or less as usual" on Tuesday. "We've made a reasonable offer to the GMB, which includes increasing the amount our firefighters are paid, and backdating that increase, in recognition of the expanding role they play in keeping the site safe," it added. "We are disappointed that they rejected our proposal."